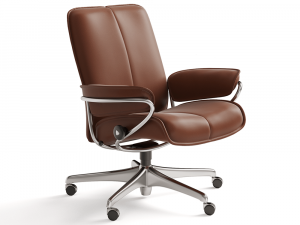 Enriched with classic Stressless heritage, the Capri office chair invites you to lean back and ease out. 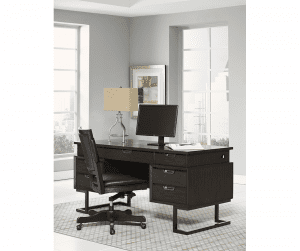 Get yours today and make your at home office work a little more Stressless. 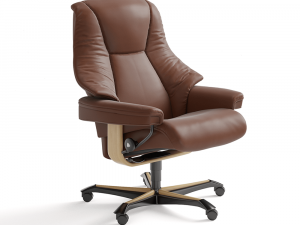 Available to custom order in a wide variety of fabrics, leathers and wood finishes. 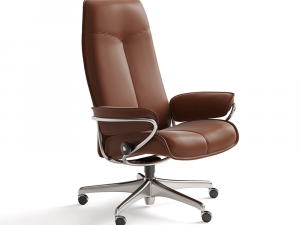 The Stressless Consul Office chair is built with perforated foam molded directly over the frame. The indentations in our new Comfort-Zones™ technology allows your body to sink deeper into the seat, giving you an enhanced feeling of personal comfort. An additional pad of soft space-age foam ensures optimum comfort. 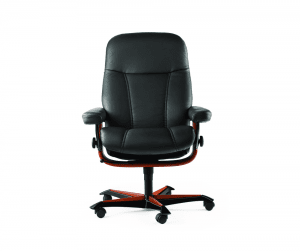 The super-soft polyester fiber cushions your body and ensures an attractive look while the Plus™ system adjusts the lumbar support, along with the headrest, to give you the perfect support in any position. 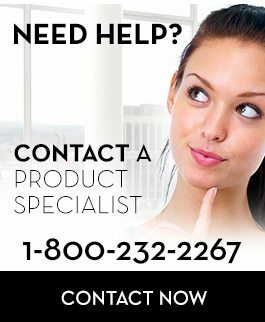 Additionally the Stressless® Glide wheels let’s you adjust to the most comfortable position simply by using your body weight. Available for custom order in a wide variety of colours and leather. Smart and stylish. 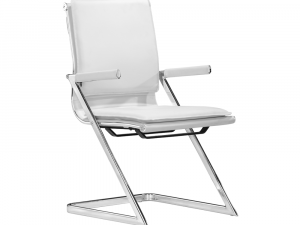 Contemporary office conference chair available in black or white, with chrome finish. 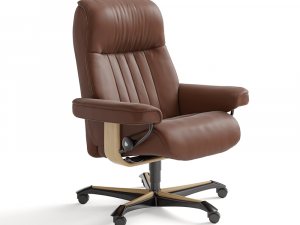 The Stressless Crown has a traditional look based on the shape of the legendary Stressless Royal from 1981. This characteristic tub shape provides truly unique sitting comfort. 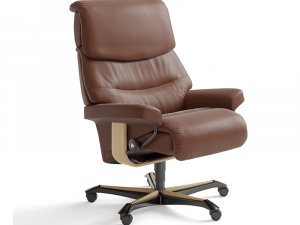 Stressless Crown boasts all the same features for which Stressless is famous, including the patented Plus system, which provides perfect support for the lower back and neck in all positions. 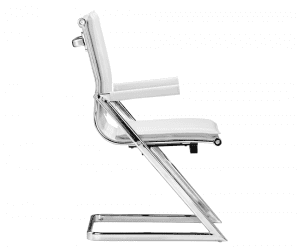 The Comfort Zones in the seat let you sink more deeply into the seat and back. 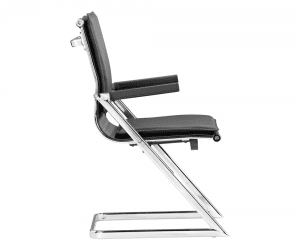 The glide function follows the movement of the body and adjusts to your body weight, while the footstool features the same function and together guarantee ultimate sitting comfort. 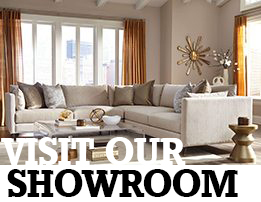 Relaxed contemporary style for casual modern living defines this gorgeous collection. 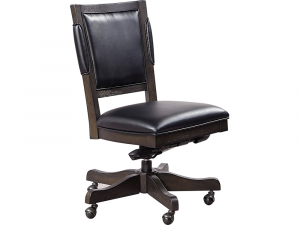 Adjustable height controls; Bonded leather on front and back; Padded sides; 5 star base; Knee tilt; Gas lift; Rubberwood solids and hickory veneers. Also available in Fossil finish at no additional cost. Featuring silver leaf accents and custom hardware, the collection’s clean silhouettes are highlighted with sculptural details inspired by everything from driftwood to nautilus shells. Sleek and sporty, the Desk Chair is embellished with a band of walnut and combines old-fashioned comfort with contemporary style. 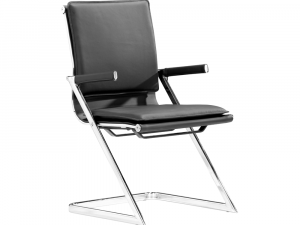 Fully adjustable, the chair swivels on a five-point metal base. 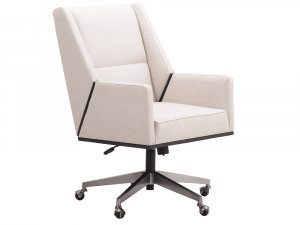 Upholstered in High Performance fabric. Marrone, Pizzo accent, Nickel hardware. 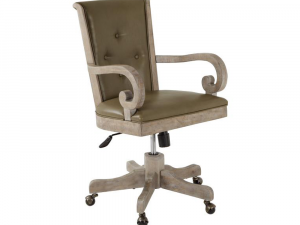 This Gustavian influenced home office collection creates a charming ambiance with its architectural details and rustic appeal, offering you a relaxing and stylish place to complete your work at home. Crafted with weathered pine solids. 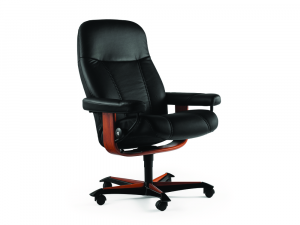 Designed with a traditional Stressless look the Stressless Live is a recliner that just gives and gives. Pulling out all the stops on the padding, which embraces you from the moment you sit down until the moment you get up, the chair is equipped with the patented Plus-system, which provides perfect neck and lumbar support in any angle, as well as the glide function, which follows movement and adjusts to your body weight.